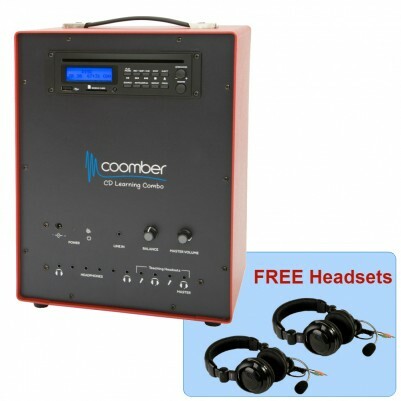 The CD Learning Combo now comes with a FREE One-to-one Mentoring Package for schools comprised of 2 headsets. Get all you need in one go and see your students' speaking skills improve session after session. This CD Player with iPad connection is a great little transportable unit ideal where a compact CD player with built-in speakers is required. It has USB and SD card slots and you can connect and amplify a tablet, smartphone or laptop. The strong metal case will protect the unit so that you can enjoy using it for many years. This is model 44372-R1. Use the speed control to slow down the audio to give the audience time to listen to it so that learning dance, music or language is easier to understand. Present a slide show and talk over the sound track. This allows you to be clearly heard without raising your voice. Use the remote control functions of the CD player to give better control and flexibility of use. Take this small robust portable unit to wherever you need to use it. The rechargeable batteries and the built in handles gives you complete freedom when using the 44372 CD Learning Combo. Connect and amplify other devices such as tablets, smartphones or laptopts. Wherever you need to have clear amplification of your CD for music or speech, this CD player with iPad connection gives you simple control, reliably every time you need to depend on it. The line input will amplify any external audio device with a suitable output such as iPods, iPads, tablets, laptops and smartphones.